FIGG Bridge Engineers worked on major bridge projects in Maine, including the Penobscot Narrows and Sarah Mildred Long bridges. The company that designed a Miami pedestrian bridge that killed at least six when it collapsed Thursday was involved in the construction of at least four bridges in Maine. 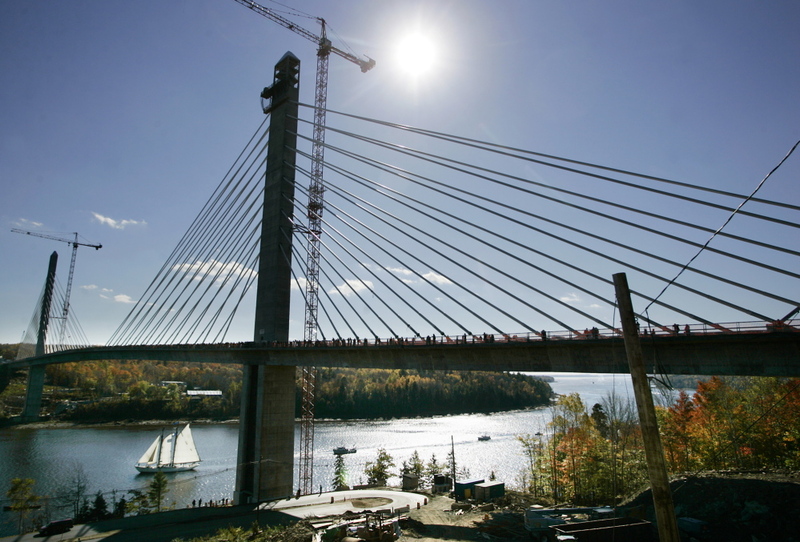 FIGG Bridge Engineers, an internationally known firm based in Tallahassee, Florida, helped design the new Sarah Mildred Long Bridge between Kittery and Portsmouth, New Hampshire; the Penobscot Narrows Bridge near Bucksport; the Sagadahoc Bridge in Bath; and the Wiscasset Bridge. Maine bridges are safe and evaluated based on the latest national standards, Maine Department of Transportation spokesman Ted Talbot said in a statement Friday. None of the three completed Maine bridges FIGG designed were included in a list of structurally deficient bridges put out last year by TRIP, a national transportation research group. FIGG, in a statement Friday, said the Miami event was “unprecedented” in the company’s 40-year history. “No other bridge designed by FIGG Bridge Engineers has ever experienced such a collapse,” the company said in a statement. The company worked on the Kittery-Portsmouth bridge in partnership with Hardesty & Hanover, a Boston-based engineering firm. FIGG also worked on the Leonard P. Zakim Bunker Hill Bridge in Boston. The $164.8 million Sarah Mildred Long Bridge was supposed to open in September, but has been delayed six months by Cianbro, the Pittsfield-based construction company building it. The Maine Department of Transportation has said the lift span bridge is safe and operational. The department recently ordered Cianbro to open it to traffic by the end of March. The pedestrian bridge at Florida International University collapsed onto a busy highway Thursday, killing at least six people and injuring nine others. The 950-ton span was still under construction. The $19.4 million Miami bridge was built by FIGG and Miami-based MCM Construction Management. Talbot said it was difficult to correlate the Florida bridge with Maine’s bridge inventory. “Due to the investigation being in its early stages, we, along with the rest of the nation, do not know the cause of the bridge collapse nor will we speculate,” Talbot said. In an emailed statement Friday, FIGG said it was “stunned by the tragic collapse” in Miami and would cooperate with appropriate authorities to find out what went wrong. The company has worked on more than 230 bridges in the U.S. and has designed almost 35 miles of bridges in the Gulf of Mexico and the southeastern Atlantic region that have withstood multiple hurricanes, FIGG said. Bridges are inspected every two years by state authorities, it said. FIGG Bridge Builders was fined $28,000 in 2012 to pay for four violations when a piece of concrete fell from a bridge project after the company allegedly did not get consent to modify a girder used during construction, according to the Virginian-Pilot newspaper. MCM Construction Management has been fined for workplace violations four times since 2013 and has been sued for negligence and personal liability cases, according to the Miami Herald.